WOW, what a month February was!! It feels as though I’ve hardly had time to process the whirlwind of events that have happened recently, so I’m just going to jump right into this wrap up and see what happens. In February I read a total of ZERO books. That’s right: I read nothing in February. Well, that’s not technically true. I read SO MANY articles and short stories and poems (sonnet overload for my Renaissance Poetry class), but no novels to speak of for the entirety of February. This is the first month in ages that this has happened (years, even?) but I’ve come to accept the fact that it simply can’t be helped. I’m been incredibly busy this semester and free reading time just doesn’t fit into my chaotic schedule. But my spring break starts in two weeks, and you can bet that I’ll be sitting down with a good book (or two or three) when I finally have some free time on my hands! My second semester of sophomore year started off with an event I’ve been looking forward to for months: the annual tap show! 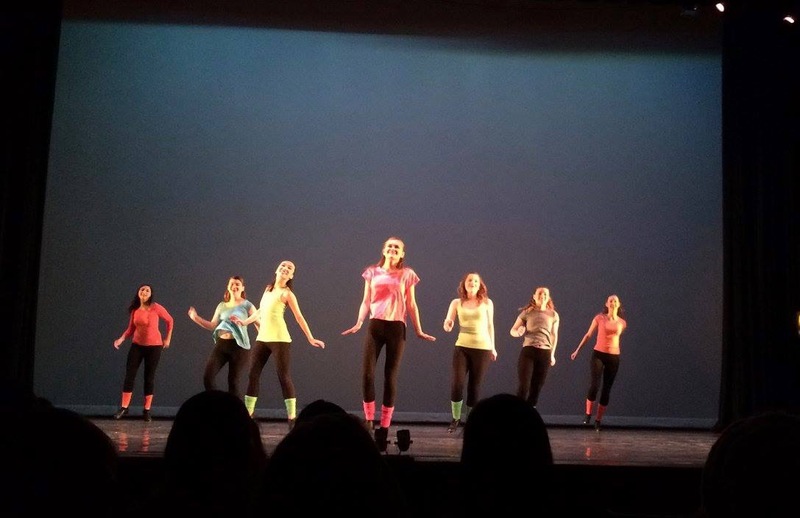 I’m part of my college’s tap dancing group, and each February we have our annual show. Our opening night had the biggest audience of Tap Out Loud history, and it was amazing to feel the support and appreciation of all of my peers. It was also surreal to see the dance I choreographed to “Wake Me Up Before You Go-Go” by Wham! actually performed on stage. Definitely a night to remember! 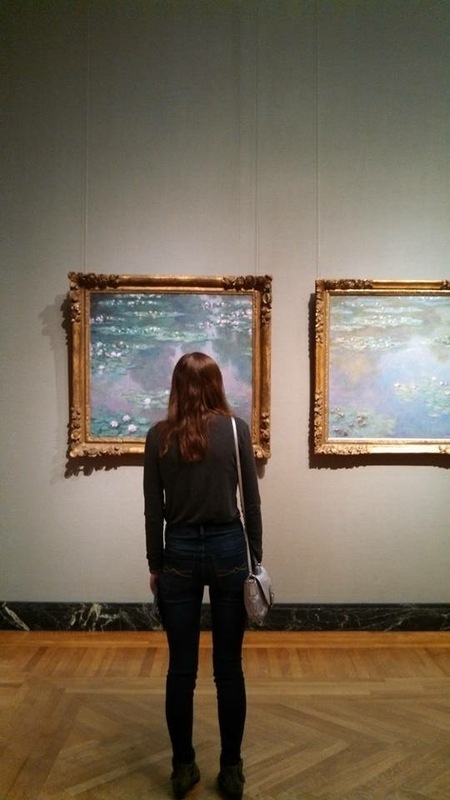 In front of my favorite paintings by Monet. The fun continued when I went to see the movie version of the musical Newsies. HOLY COW, THIS MUSICAL IS AMAZING. The choreography is so impressive, especially since I had no idea that this was such a physical, energetic, dance-heavy musical. Jeremy Jordan was fantastic and I’ve basically had the soundtrack playing on repeat since that day. If you’ve never listened to Newsies, I highly recommend checking it out! Then came the magical day when my friends and I went to NerdCon 2017 in Boston. I recently wrote an entire Top Ten Tuesday post about the amazing time I had there, which you can check out by clicking here. I met so many talented, kind, inspiring people who I’ve looked up to for years, as well as some that I’m looking forward to looking up to in the future. It was absolutely surreal to be surrounded by thousands of Nerdfighters (and JOHN AND HANK!!) and I’m so grateful that I had the opportunity to attend such a wonderful event. 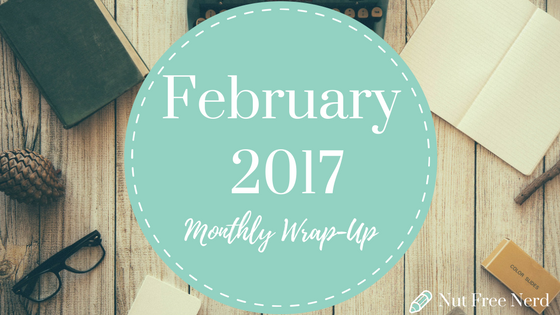 How was your month of February? What was the best book you read? Have you ever had a month where you read nothing? Did you do anything really fun or exciting? Let me know in the comments section below! Thanks for the shout-out! And I LOVE the picture of you tapping. It’s so cute!! And I haven’t seen the Newsies musical, but I have the soundtrack from it, and it’s AMAZING! Awww thanks! 🙂 Ahhh and I’m so glad that you’re a fan of the Newsies music, too!!! Firstly, it is perfectly fine that you read zero books. I mean, what can be done? Sometimes we are too busy doing other things or with life in general. I hope March will give you more reading time. You’re so right– there’s nothing that can be done about it! Sometimes it’s even nice take a break from doing to so much reading. That way it’ll feel even more special and rewarding when I actually get around to doing some reading for fun! Totally can relate to the lack of pleasure reading going on this semester. Yesterday, while visiting an old professor, I told him about it, and how weird it is since I’m taking fewer classes than in the fall. Seriously looking forward to some R&R with a fun read over spring break! OMG you’re right Newsies is SUCH an amazing show. I think that it’s really important because dance heavy shows aren’t always taken as seriously in the theater world–even though they should be! Newsies is one of those shows that you know can prove everyone wrong. That’s such a good point!! Honestly dance heavy shows are so impressive, I have no idea why they aren’t taken more seriously. It’s such a workout for the cast and adds a layer of complexity to the show overall.